Sad to say it’s over. For now. What a season! Ended up with a gorgeous day yesterday, lots of birds, even hit some, and Peat made several flawless retrieves and was a joy to watch. Angus had stepped up his game the past several hunts, and finished strong yesterday, too, with a marvelous retrieve of a Hungarian partridge that landed in the creek way, way down there. Here’s a video of the last few hunts. Stay tuned for Leslie’s 2015-2016 highlight film. Thanks for taking us along on the adventure Bob! Thanks for a great ending for this season! Perhaps it’s in the info somewhere, but wondering what Boots you wear for your hunting? Thinking my Russels for pheasant hunting the Dakotas down thru KANSAS may not be the best for the mountains. Thanks for your comment, Kent. 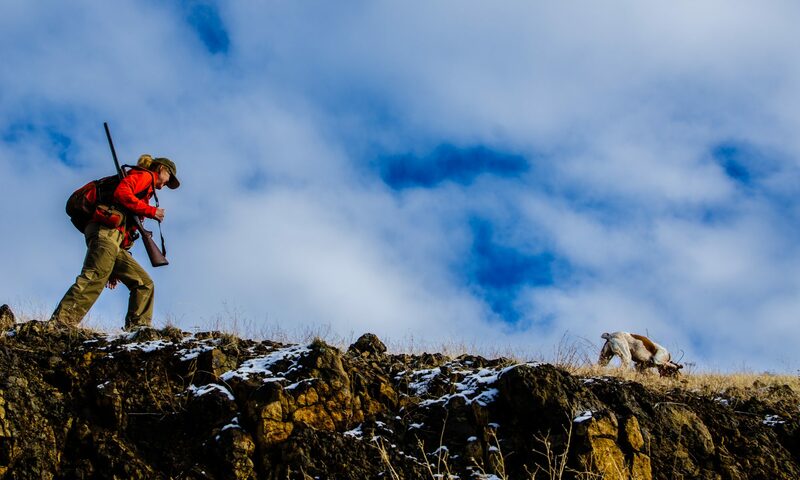 Boots are the single most important piece of equipment I have for chukar hunting. I use Asolo hiking boots, 10″ high, Gore-tex. They don’t sell it in the U.S., but I found it by chance at Sierra Trading Post. Any durable hiking boot, without insulation, will do if it fits well. My ankles are shot so I have to have super tall boots. Kennetrec makes a good boot with a rand around the boot just up from the sole, which is critical to keep from tearing through the leather when walking through scree fields. I’m dreading replacing mine – they have about 500 miles on them and the soles are wearing down. I’m looking at having to spend about $500 to find another suitable boot. Good luck! Glad to see Peat is working out for you! There are only two seasons in the life of a real hunter: hunting season and getting ready for hunting season. It is good to hear that Peat made such a gain this season. Well done as a trainer!!!!! Congratulations on a very successful season. You’re stories, pictures, and video’s are what we all relate to when it comes to bird hunting. You tell it like it is. Good luck to you, Leslie, and your four legged friends in the future. Thank you Leslie for the great effort in tagging along with Bob and making it real for the rest of us. Thanks, Larry. You’re my idol (seriously). My bucket list has meeting you and hunting with you next season at the top! (Don’t worry – I’m not trying to steal your secret spots, I just want to see with my own eyes what a real chukar hunter does!). Glad you stuck it out with Peat, looks like a hell of a year. Nice job with peat Bob. It makes me very proud to see this much progression in his 1st year! You’re the best! Both Leslie, you & the brits.